There are certain stories that can’t be retold, remade, or adapted too many times. How many versions of Cinderella, Sherlock, Frankenstein, and Robin Hood exist in iterations both exact and, well, frankly far-fetched? A lot, that’s how many. Adaptations–both good and bad–are a grand tradition and almost none get more play than in the vast archives of British literature and European myth. There’s one British tale, nay legend, that has been mined and reforged so many times that most people have no idea whether the story is based in historical fact or pure fiction. And that’s even before considering the story in question often includes magic and dragons. That grand and legendary tale is, of course, the myth of King Arthur and since (literally) medieval times, renditions of his rags-to-stone-stuck-sword tale have been told. The latest to take on the famed British king is Attack the Block director, Joe Cornish. The twist? Well, honestly, the title says it all, the new owner of Excalibur is a 12-year-old kid…in modern Britain. But we can expect much more than just a kid with an ancient weapon looking for a dragon to slay. The modern updates are clever, the kids are badass, and their adversary, Morgana (Rebecca Ferguson), isn’t messing around. Here’s everything we know about The Kid Who Would Be King. Cornish’s updated would-be king of England is a kid named Alex, not Arthur, and though he be but young, 14-year-old actor Louis Ashbourne Serkis comes from his own line of distinction. If that last name sounds familiar it’s because he’s the son of acclaimed actor and director Andy Serkis. Serkis the Senior is single-handedly responsible for elevating the art of mocap acting and CGI creatures and can also be seen in the flesh playing character roles ranging from loveable to villainous. His diversity is rare in Hollywood and likely inspired his son to pursue the art. The younger Serkis has done a fair amount of television and voice acting, though, and also played the role of the adolescent Mad Hatter in 2016’s Alice Through the Looking Glass. A boy who can stand up to the pressure of playing a young Johnny Depp may seemingly be well-equipped to take on Britain’s greatest hero. Arthur the Orphan – Instead of being a scrawny orphan, mistreated by his uncle and cousin, Alex is an average 12-year-old familiar with a different sort of bullying. He and his best friend, Bedders, often take the brunt of their schoolmates’ cruel tauntings. The Knights of the Roundtable – If Alex’s schoolmates’ names sound familiar it’s because they are iterations of the famed round circle knights. Lance (Tom Taylor) like Sir Lancelot, Kaye (Rhianna Doris) like Sir Kaye, and Bedders (Dean Chaumoo) as in Sir Bedivere. 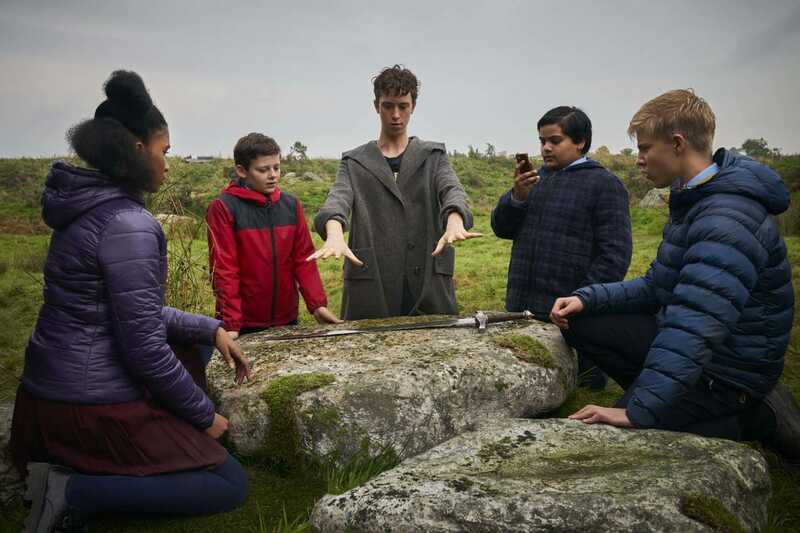 Tree Sparring – As seen in the trailer, when Merlin attempts to train Alex and his friends to take on Morgana, he uses his magic to summon trees to spar with the newly knighted warriors. Branches make for good practice swords. Still Stone-ish – The sword in the stone, a staple of Arthur’s legend, is how the world knows he’s the chosen king. But Alex lives in an urban area with not a lot of random sword-bearing-stones. When chased into a construction area, he finds the famed sword protruding from a cement column. Stone, concrete, it’s all the same to the sword. I’m A Cool Merlin – Merlin, usually seen as old and grey, is a quirky teenager in Cornish’s vision. He comes to warn Alex that in four days, at the solar eclipse, Morgana (Rebecca Ferguson), the famed evil enchantress and enemy to Arthur, will enter Alex’s world to try and take over Britain. Moreover, Merlin can transform into an owl, perform magic (of course), and, at one point in the film, returns to his older form (played by Patrick Stewart) for an as yet unknown reason. A Round-ish Table – Alex assembles his knights, situating them around his family table. It’s not quite the fantastic table crafted for Arthur’s original knights, but Alex discovers by lifting the folded leaf flaps of the table, it does at least become round. An Inspiring Hero – The Arthur of old may have inspired his troops to ride valiantly into battle with impassioned speeches; Alex rallies his schoolmates with the enticement of missing class. It pays to know your audience. A Magical Metro – Alex and his knights can travel around Britain using the various ruins and ancient stones scattered about the country, with Stonehenge operating as a sort of central train station. The Lady of the Bathtub – Arthur had a good spot for keeping Excalibur when not in use, storing it away with the Lady of the Lake and returning to her when he required use of his sword. Alex performs a much more portable trick, summoning the Lady of the Lake by filling up his bathtub and calling for her. Morgana’s Army of the Dead – Morgana, renowned for her magical abilities in every iteration of the legend of King Arthur, takes advantage of Britain’s very old history. Knowing that plenty of British soldiers of old lie buried beneath Britain’s soil, she calls up an army of the dead to aid in her takeover. Zombie knights and an Army of Darkness vibe. Awesome. A story that never grows old and a country in need of reminding of both its epic history (even if it is just lore) and the strength that comes with unity, makes for an inspiring-looking film. The Kid Who Would Be King is set to be released in the United States on January 25, 2019, and in the United Kingdom on February 15, 2019, by 20th Century Fox.